We asked Etsy about the color change this afternoon, we'll provide an update when we hear back. So what's the big deal? As one seller wrote, "The black stars look like they are blank and yet to be filled with gold stars." Later in the day, a seller rejoiced when it appeared the stars returned to their brighter gold color, but the relief was short-lived as other sellers reported seeing the same black stars in Etsy listings. One seller said they had seen the black stars for a couple of months and suspected it was a test that was over and was being rolled out permanently. Update 10/11/18: We haven't heard back from the company, but an Etsy Product Manager cleared up the mystery - the change to the color of star reviews was made along with other updates across the site to make it easier for people with disabilities to view. Responding to the discussion board thread, she wrote, "These changes help us to continue to make shopping and selling on Etsy an inclusive experience and allow us to stay up-to-date with current online accessibility standards. 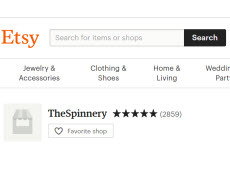 We appreciate your understanding as we continue to make Etsy.com more accessible for our entire community." So it would seem the uannounced change is here to stay. YEP >>>>> ALL BLACK STARS. Retards at the helm of Etsy. You would think their IT guys would have better things to do with their time in fixing actual problems! "typical do something, for no reason, that does nothing, accomplishes zero, but it's actually something"
It's maddening isn't it? People justifying their jobs and their existence. Always trying to fix what isn't broken. Here we go again. Making stoopid changes. At least if they'd give us a reason WHY. The more CHANGES they make, the more people will complain. The more people complain, the more their stock price drops. CHILL, Etsy. What these idiots fail to understand is buyers can be alarmed at the smallest change , buyers often visit a site multiple times before they purchase, they need repeatability and the site needs to be stable, a buyer needs to feel comfortable, even a small change as meaningless as changing a color, can be enough to alter their thoughts subliminally, they might not even be aware of the change, but something is different, something not the same, some thing wrong, and next thing you know they are going somewhere else. Baffling it has yet to announce the changes. This company honesty makes it up as they go, if impaired vision was the reason, they should be starting with the light grey text, instead of the huge stars because that's the worst offender for people with even a little bit of bad vision, , light grey text will make you blind., and etsy has a lot of it. I worked with a start-up that was launching an extension of their existing *youth* sports product and the company was choosing a name for the line. The CEO wanted to name the line ''BlackStar'' because he thought kids would think it sounded cool. Clearly being the only Bowie fan around, I filled them in and fortunately they went with another name. Applaud Etsy's intent, but according to colorblindawareness.org, Colour Blindness affects approximately 1 in 12 men (8%) and 1 in 200 women in the world. It seems odd this option wouldn't simply be a part of a site ''theme'' selectable as a user configurable option instead of thrusting it upon all their users. ''Dark mode'' toggles are fast becoming common in mobile apps (and even desktop browsers), it would seem something similar could be employed for color-blindness. They have a lot of people on the payroll that have to make it look like they are doing something. Think of it as a kindergarten for coders. I wonder how many people are going to look at the black stars and think that's a gauge of negative feedback.